Did ancient “visitors”—of extraterrestrial origin—come to Earth long, long ago and fashion man in their own image? Did they then lift the human race out of the ashes of a great global catastrophe around 10,500 BC? Were the science and secrets that they taught the ancients intended to be a guide for all humanity to the present era? Was this crucial information about our future and our true past hijacked by secretive cabals, some with bad intent and some with altruistic designs, who have held these secrets over the millennia? New York Times bestselling author Mike Bara says the answer to each of these questions is “yes.” He examines ancient documents, including the Bible, to delve into the true story of the beginnings of mankind. He establishes the reality of the major catastrophe that jolted the human race, and traces the history of secret societies from the priesthood of Amun in Egypt to the Templars in Jerusalem and the Scottish Rite Freemasons. He shows how the spiritual wisdom and scientific knowledge the ETs sought to bestow on all humanity were kept by these secret societies for their own benefit. The influence of these sects and their extraterrestrial ties are said to be the stuff of myth, but Bara will show readers that this influence is all too real, extending even into the political arena. He has a very interesting take on the Kennedy assassination! Bara also reveals the true origins of NASA and exposes the bizarre triad of secret societies in control of that agency since its inception. In the end, Bara shows how NASA is manipulating the space program to fulfill occult purposes—which may lead to our meeting the very ETs we have been inextricably linked with since the beginning. Chapters include: Out of the Ashes; From the Sky Down; Ancient Aliens? ; The Dawn of the Secret Societies; The Fractures of Time; Into the 20th Century; The Wink of an Eye; The Occult Space Program; more. 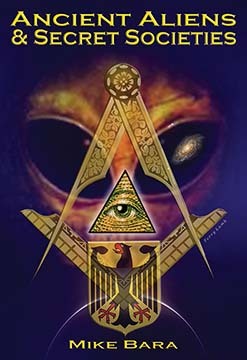 ANCIENT ALIENS & SECRET SOCIETIES EBOOK By Mike Bara. EBOOK. Illustrated. Bibliography.